Software program for professional analysis of graphical measurement instruments. Many options for a simplified identification of objects. 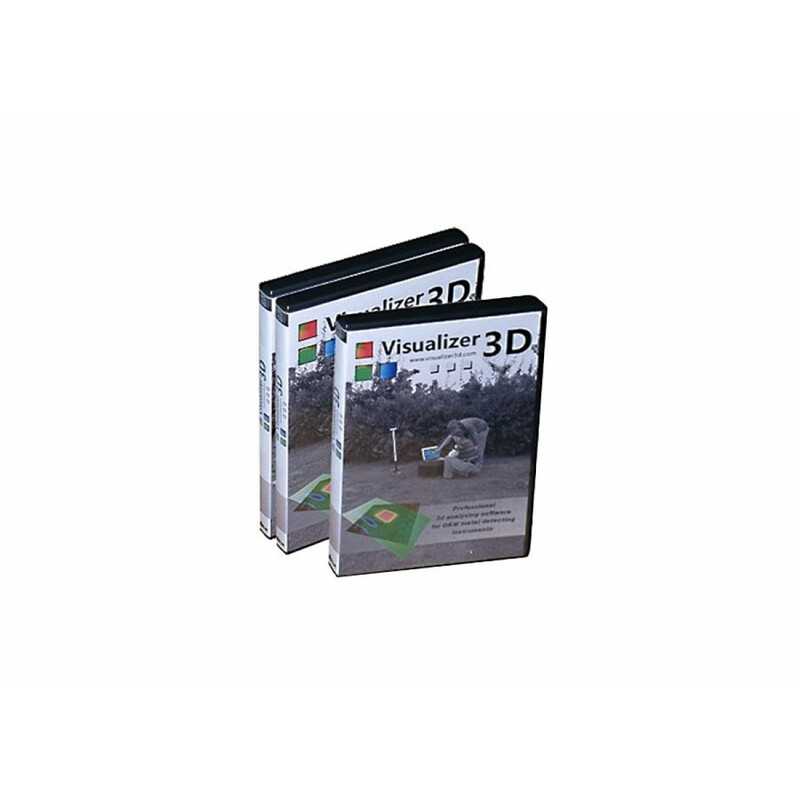 This new and completely revised software Visualizer 3D provides improved graphics and sensational depth measurement. All metals are accurately represented where they are situated under the surface. 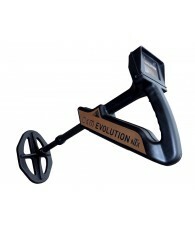 The depth measurement has been adapted to the different types of soil. The software program is compatible to all Rover C, Rover Deluxe, Walkabout and Walkabout Deluxe devices which have a control chip. It is possible to rotate the 3d graphic in all directions by 360°. So it is possible to get different views from the underground such as side view, top view or perspective view. No object will be missed due to the possibility of moving the graphic into various directions. Rotate the graphic by 360° around x-, y- or z-axis so you can see your located treasure from all sides. Zoom into your scan images to see even small details, zoom out to see a compact view of the whole scan. So you can easily find voids, hidden rooms and possible entrances of underground chambers. 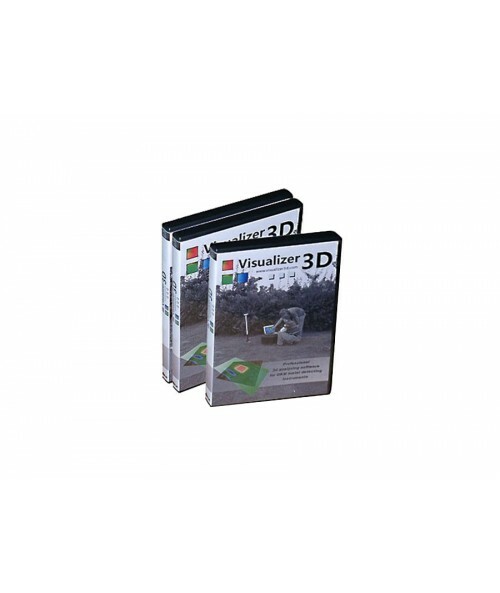 Due to this 3D software for metal detectors it is possible to determine the depth of located targets and voids. Depth measurement is precisely adjusted to the local ground conditions in your area. 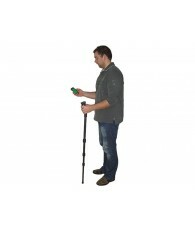 The depth penetration of a metal detector can change because of the local conditions of the underground. So it can vary in different soil structures and soil types such as loam, sand, rocks, mineralized soils, concrete or others. The penetrability of the ground is important for the scan results and influence the depth measurement of every metal detector or geophysical measuring system. 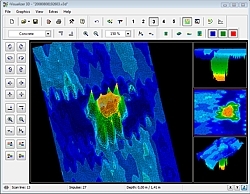 OKM software engineers developed a unique way to determine accurately the depth of anomalies by adjusting the type of soil in the measured area. 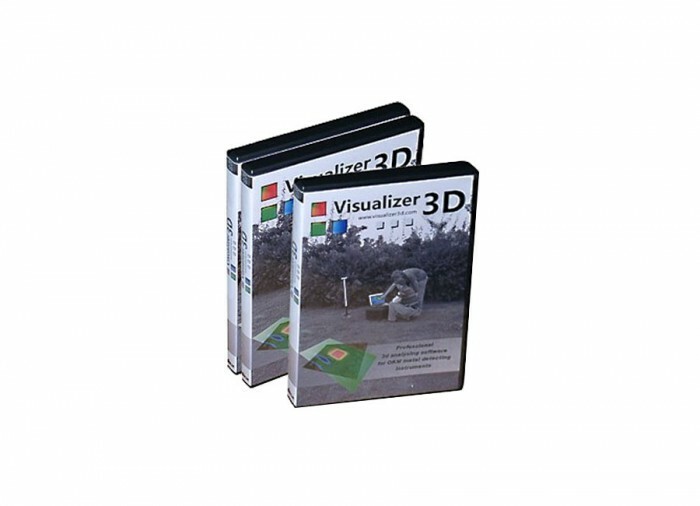 The Visualizer 3D software allows the prospector to enter the dimensions of his scanned area in feet or meters. So the represented 3D graphic is visible in real proportions. The cross hairs navigation through the arrow keys of your computer keyboard allows to pinpoint the exact position of a detected item in an easy and user friendly way. You will not miss any object because of digging at the wrong place. The wire frame view shows each measure point and scan line made with your metal detecting instrument. It split up your 3D scan image (your scanned area) to a grid view. So you can determine accurately the position of detected metal targets or cavities. When scanning an area it can happen that you will get some interference signals from the environment. For example when you are working in urban areas where are lots of electric machinery, high voltage lines and mobile network. The 3D software includes a function to eliminate such error signals. It is possible to remove a particular signal or use the automatic function to reduce all fail signals. In this way you can guarantee that all errors are removed from your graphic and concentrate yourself on the measured values of the underground. The software offers a printout function, so you can print all your scan images on a connected printer. 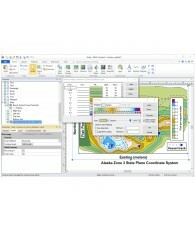 Different views of the graphic together with all entered project data such as file name, characteristics and field size can be printed. The software includes the possibility to represent a live picture of the underground. This allows you to see in real time what is situated under the ground. This feature requires the usage of the geophysical instruments Future 2005 or Future I-160 and the appropriate probe. The live picture can be obtained in Side View (with ultrasound probe) or Horizontal View (horizontal multi-sensor probe). The software offers also the possibility to distinguish between ferrous and nonferrous metals if the Super sensor is connected to your metal detector. Via a curve shape in the main window of Visualizer 3D you can recognize and identify ferromagnetic metals, precious metals as well as cavities. The integrated technology of the Super sensor is required to use this feature. The software reproduce automatically missing signals to receive a complete 3d graphic of the underground. Some reasons for missing some signals can be for example when you power of the device before finishing your measurement or when you lose signals during the transfer of the measured data via the radio transmission unit to your PC. You don’t have to be a professional in using a computer, anyone can easily use this software program.